Mark Davis reached the last 16 of the Riga Masters in Latvia at the weekend. 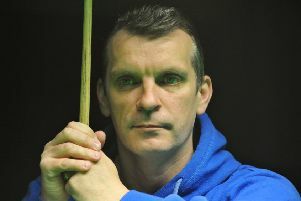 Snooker star Mark Davis defeated two of the world’s top 20 ranked players during an impressive first tournament of the 2018/19 season. The St Leonards-based professional saw off 15th-ranked Luca Brecel and world number 18 Marco Fu en route to the last 16 of the Riga Masters at the weekend. Davis, ranked 41st, overcame young Belgian star Brecel 4-2 in round one on Friday. The 45-year-old made a tremendous start to the match, winning the first three frames with breaks of 79 and two of 62. Brecel hit back to claim the next two frames, aided by a 67 in the second of them, but Davis sealed a good victory by clinching six 66-33. He followed that result up with a 4-3 success against Hong Kong star Fu in round two on Saturday afternoon. Fu took the opening frame with a break of 75 only for Davis to bag the next two, helped by a 68 in the third. Fu knocked in a 122 to level at 2-2, but Davis won frame five to lead again. Although runs of 50 and 57 enabled Fu to level at 3-3, Davis clinched the decider 60-25 with a break of 52. Davis’s progress was halted by a 4-0 defeat to 22nd-ranked former world champion Graeme Dott on Saturday evening. Scottish cueman Dott edged the opener 65-61 and Davis scored just 31 points thereafter as Dott fashioned breaks of 51 and 68. Davis will be back in action at the World Open in China next week. His first round tie against 31st-ranked compatriot Michael Holt is scheduled for next Tuesday afternoon.